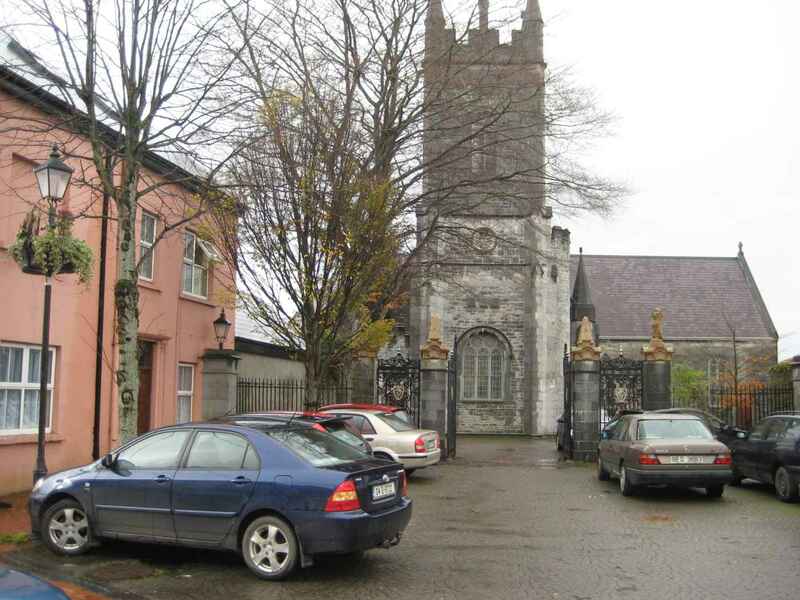 St.John's church (Church of Ireland), on Ashe St (formerly Nelson St), Tralee, Co.Kerry (see map). 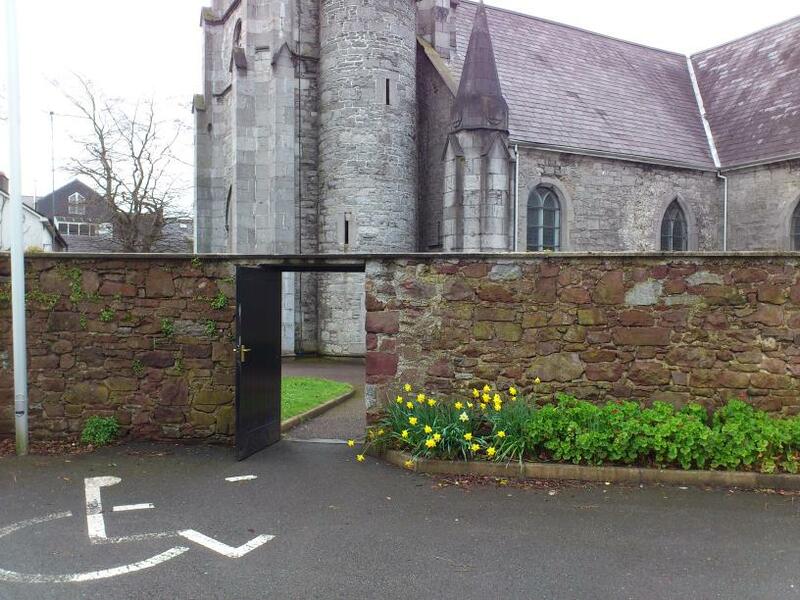 Church of St.John the Evangelist, Ashe St, Tralee, Donal O'Sullivan, 2001, [KCL] Local studies 941.96. See the Rectory on pp.20-21. Tralee in [JMD] vol 7 (1907-09), [NLI] Ir 9295 i 1. See part 1 and part 2. 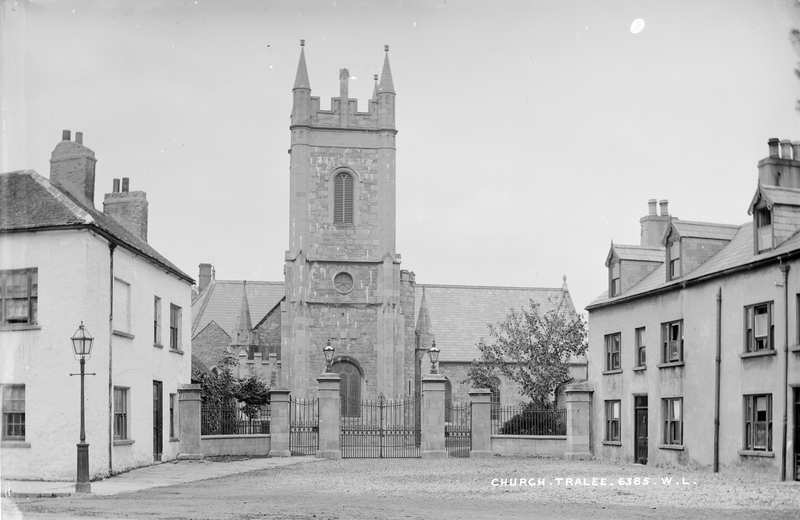 "Tralee parish church", Sir Henry Denny, 7th Baronet, pp.363-368 (1908). "Tralee parish registers", Sir Henry Denny, 7th Baronet, pp.368-379 (1908). See part 1 and part 2. This has transcripts of the "Denny Bible" (at Tralee church) and the "Denny Family Diary" (possibly in the Denny family). Vestry Minutes Books, St.John's church, Tralee, 1806 to 1967, [RCB]. The Church of Ireland church of St.John, Ashe St, Tralee. The old church on this site was built 1623. Though [Denny, 1908] says 1587. The baptismal font dates from 1623 (date on it). This is in the time of Sir Edward Denny (succ 1619, died 1646). Tralee was destroyed in 1642. Tralee was destroyed again in 1691. The baptismal font survived the destruction of Tralee town and church in 1642 and 1691. The present church was built c.1700 [Denny, 1908]. Rev. Maurice Connor was Rector of Tralee 1725-32. Rev. Barry Denny was Rector of Tralee 1741-51. Rev. Edward Day was Rector of Tralee 1751-55 and 1758. Rev. John Blennerhassett was Rector of Tralee 1765 to 1803. Letitia Blennerhassett (bapt 1780) would have grown up in the Rectory at Tralee. Rev. John Blennerhassett died 1804. Rev. James Day was Rector of Tralee 1805-18. Rev. Edward Maynard Denny was Rector of Tralee 1818-31. The church was re-modelled in 1819. The church was enlarged in the 1830s. The old church was the E-W axis, with the altar at the E end (Denny tiles). The new part is the N-S axis, with the altar at the S end. Rev. Anthony Denny was Rector of Tralee 1831-62. 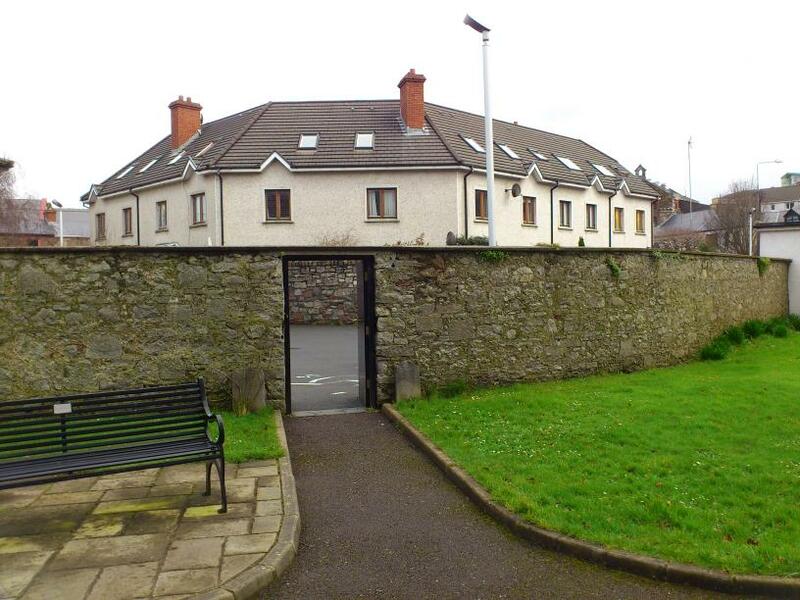 The current main entrance to the church from Ashe St is a new entrance, opened up probably 1834. The impressive gates are new. They were installed 1954. [Denny, 1908] listed the surviving monuments in the church. Many of the Dennys of Tralee are buried in the Denny vault at the E end. See also old photo of Nelson St.
Photo 2010. See larger and full size. See other shot. The old Rectory stood to the RHS of the church (looking from Ashe St) until demolished in 1995. 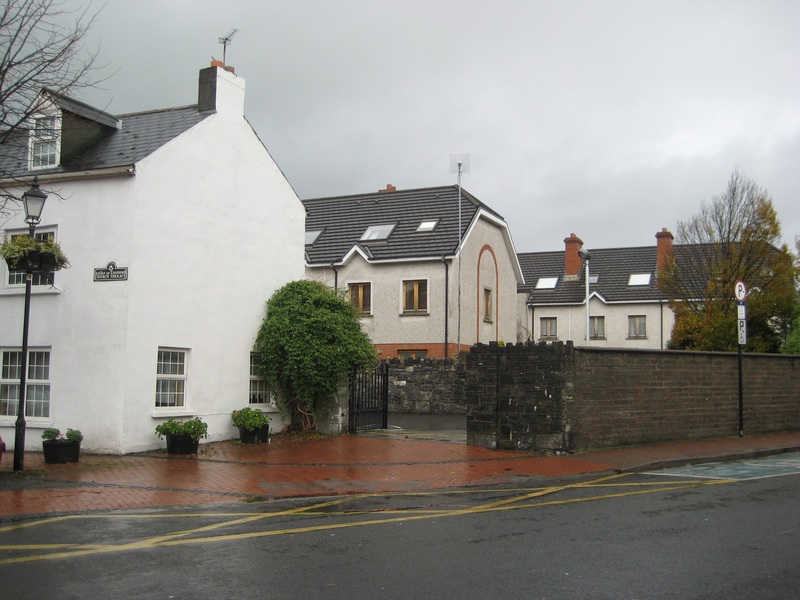 In the [Kerry Evening Post, 27 November 1895] Mary Agnes Hickson says: "I was born in that street" [Nelson Street]. 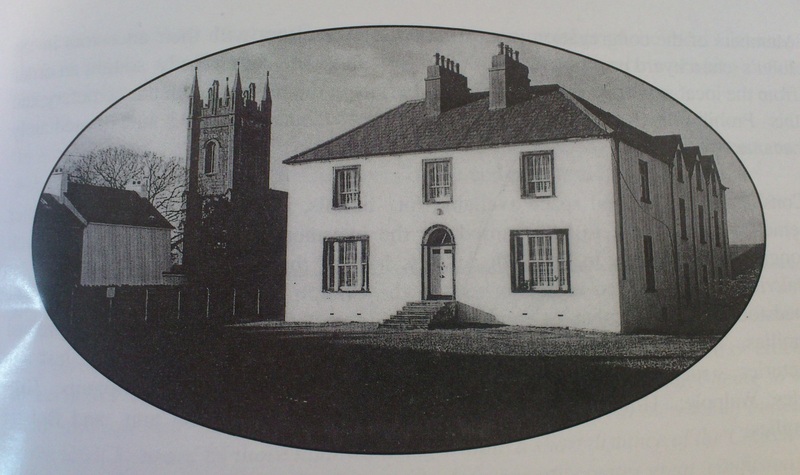 "My father's house stood nearly opposite the Rectory, built for my maternal grandfather in or about 1812, at the north-west end of Nelson St., and still the house of the Rector of Tralee." 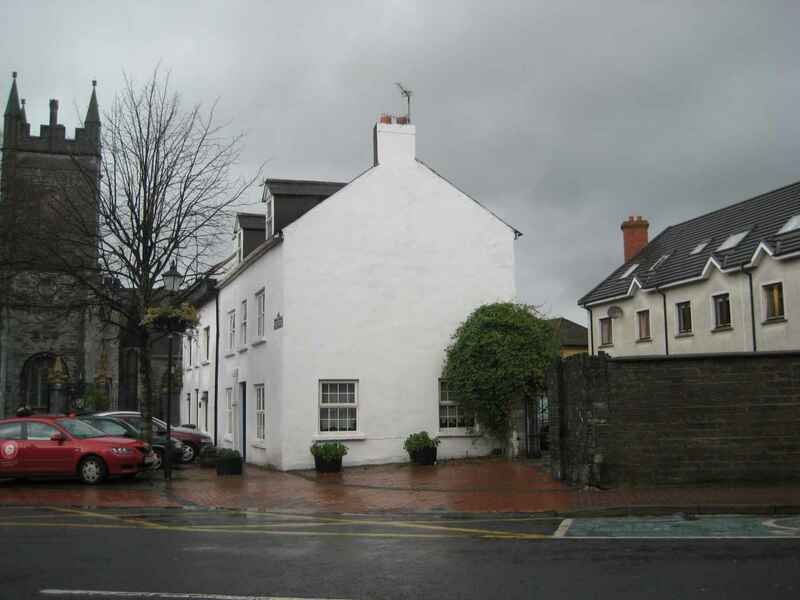 However [O'Sullivan, 2001] says the old Rectory - known as Glebe House - was built 1725. In which case this would be the building Letitia Blennerhassett lived in. Rev. 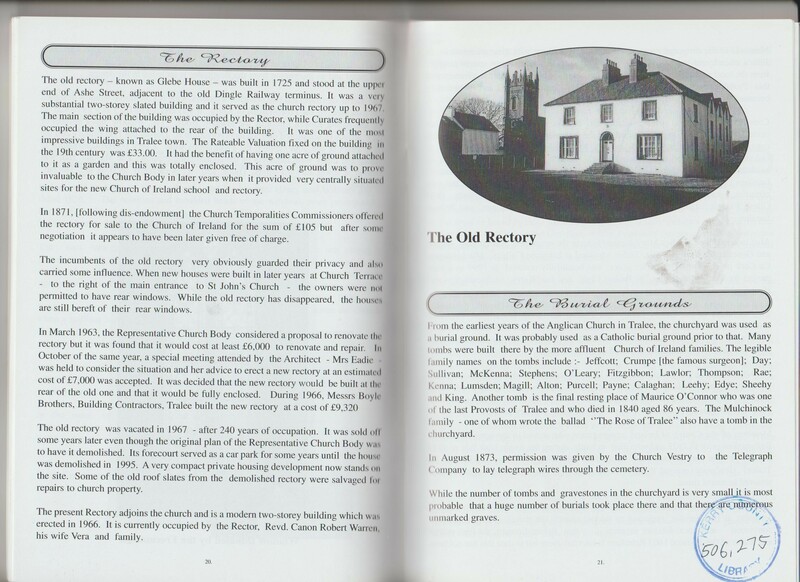 James Day, Rector of Tralee 1805-18, was reported as dying 1818 "at the Glebe House, Tralee". The Rectory had 1 acre of a garden. 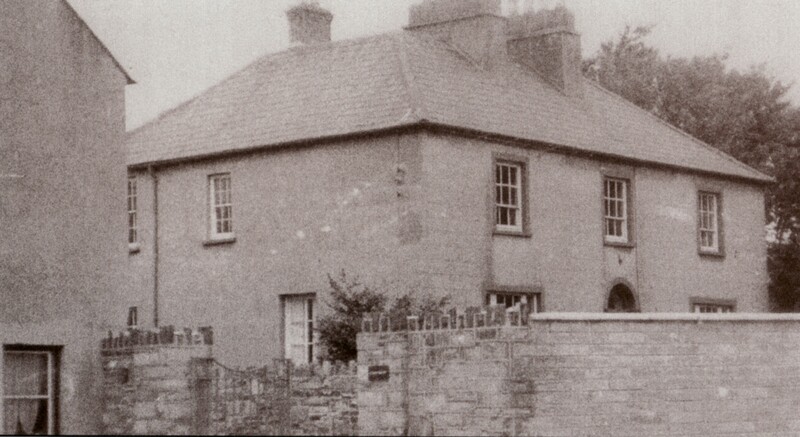 It served as the Rectory until a new Rectory was built at the rear in 1966. It was sold in 1967. It was demolished 1995. The gates survive. 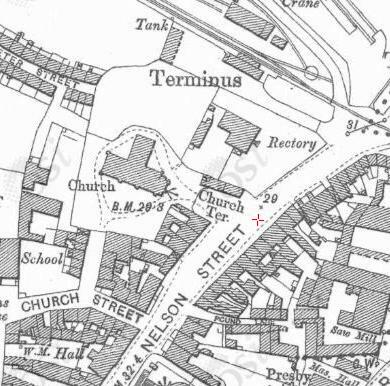 The grounds now include St. John's Parochial School (Church of Ireland primary school), the Parish Centre, and the new Rectory. From [O'Sullivan, 2001]. Used with permission. Original lost. From [McMorran and O'Keeffe, 2005]. Picture credit Russell McMorran. Used with the kind permission of Russell McMorran and Maurice O'Keeffe. The gates into the old Rectory (now demolished). Photo 2010. See larger and full size. See further to the RHS and inside gates. Photo 2016. See larger and full size. See shot to the RHS. Gate from the grounds of the old Rectory into the church grounds. Photo 2013. See full size and other shot. See 2010 shot (and wider shot). The gate from the other side (church side). The modern building is on the site of the demolished Rectory. 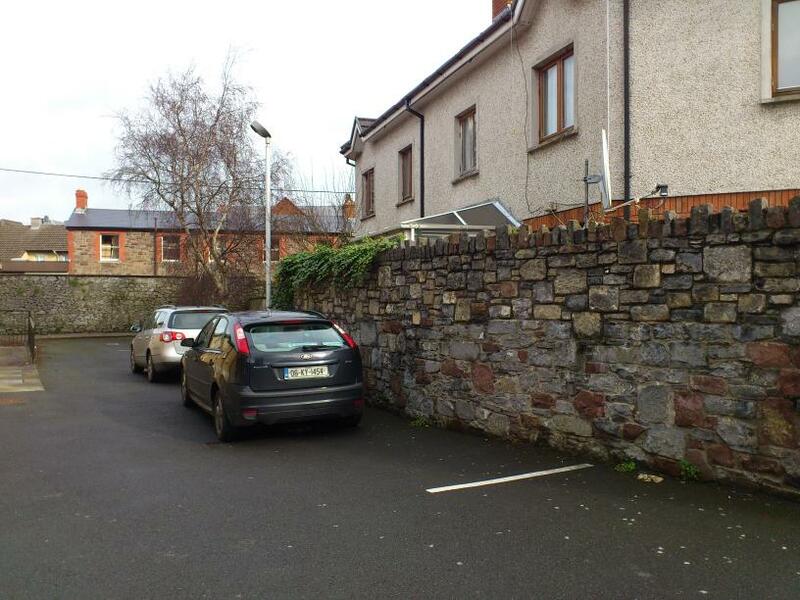 Shows that the wall here is old, while the wall round the Rectory site is newer. See 2010 shot and other shot. 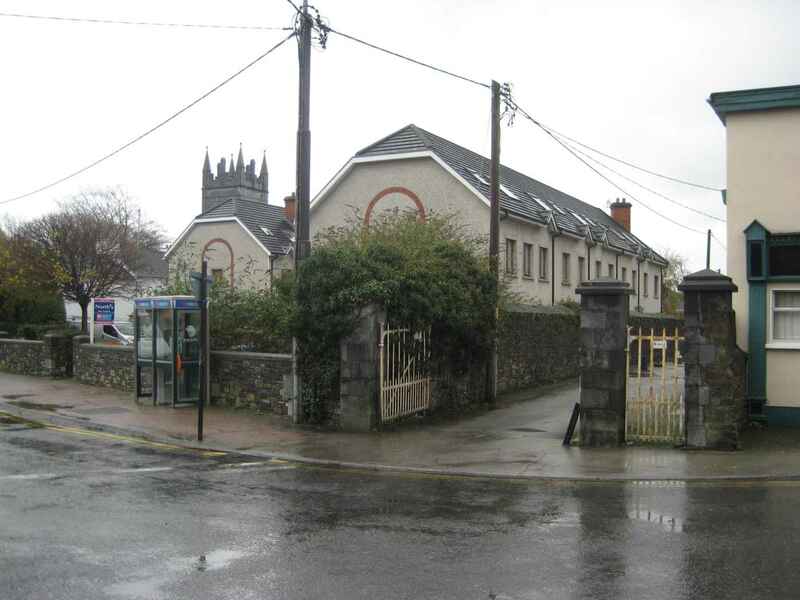 Tralee church and Rectory. 1829 to 1842 period. Tralee church and Rectory. 1887 to 1913 period. 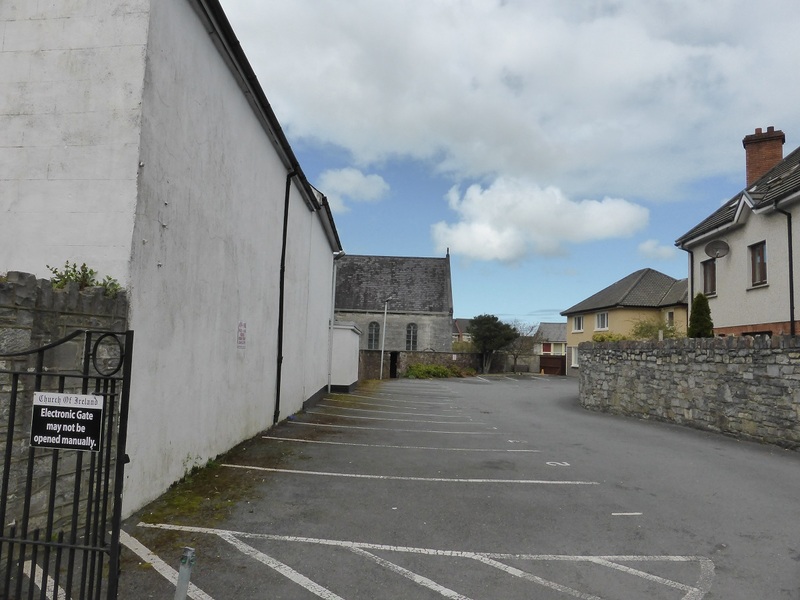 Tralee church and site of Rectory. Modern map. 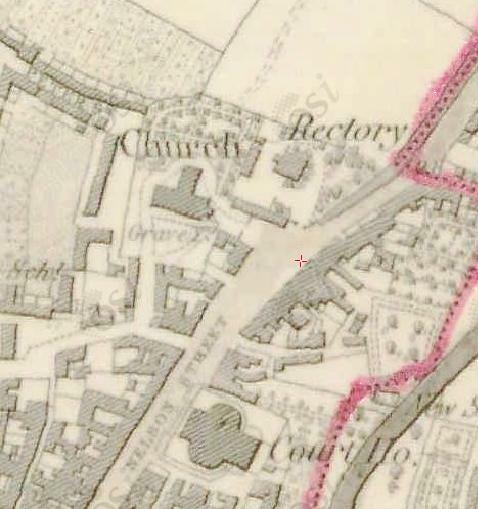 The maps show that the curving wall around the rectory site is new, while the boundary wall to the N is old. Photo 2013 shows that the curving wall around the rectory site (RHS in picture) is newer than the boundary wall to the N (background). See other shot of the curving wall. Close-up of the old boundary wall to the N (background of picture above). 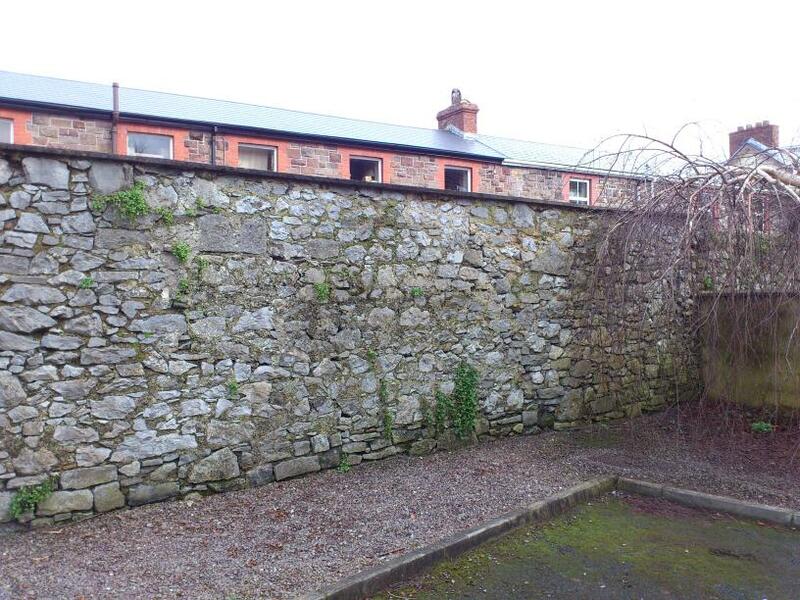 The N boundary wall from the outside (further up the road). See other shot and other shot. See rectory side of wall near the road. St.John's church (Church of Ireland), Ashe St, Tralee. 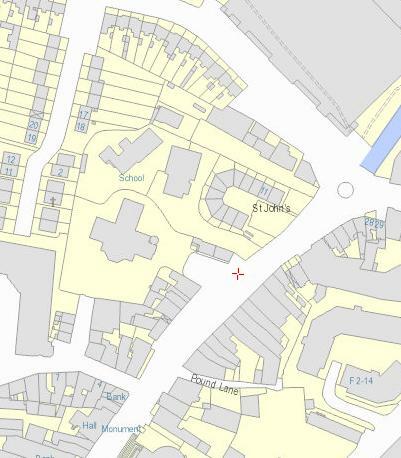 Not to be confused with St.John's church (Catholic), off Castle St, Tralee (see map and street view).